This gorgeous peacock black necklace bracelet and earrings set is made with 8-9mm cultured freshwater pearls. The peacock black pearls have beautiful green or blue overtones which add richness to the solid black color and make the strand extremely stunning. Great luster, smooth surface, round to the eye. Necklace length: 18 inches. Bracelet length: 7.5 inches. Earrings: button shaped pearl stud with sterling silver posts and nuts. Comes in a luxuary jewelry box. 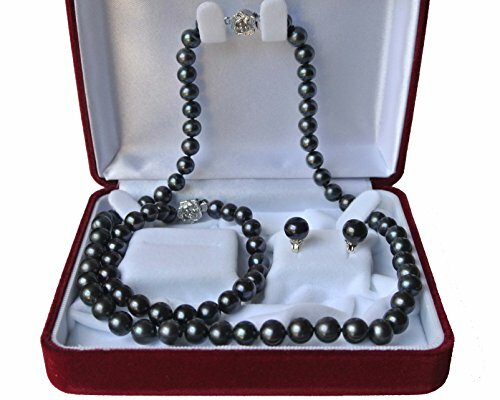 *Authentic black pearls come in a variety of tones which range from green, blue, purple, to grey. These overtones are beautiful and natural. My camera was not good enough to show the overtones on the photos. If you have any questions about this product by Elegant Pearls, contact us by completing and submitting the form below. If you are looking for a specif part number, please include it with your message.